Bhai Jagraj Singh had a fearlessness in him, that's why Basics of Sikhi reached so many hearts. What he said was that Naam was the whole thing for him, that's where it began and where it ended. We already know that Naam is supreme, but what is surprising about this situation is that a Sikh listened to their Guru. It's surprising because it's rare that a Sikh listens, believes and learns what Guru said. "We know that the only thing free from duality is Wahiguru Itself. We shouldn't think that Guru Gobind Singh is different, Guru Nanak Dev ji is different, Guru Granth Sahib ji is different, and then Wahiguru is someone else also different. Even Guru Gobind Singh ji teaches, 'aad ant ekai avataaraa, soi guru samjhio hamaaraa', 'In the beginning and the end there is only One incarnation. This is how I understand my Guru to be.' It is just the world that changes, it doesn't stay in the same form. Even if you look to other scriptures that talk about this Oneness, they often say that a Satguru is someone who tells you that Atma (Soul) and Parmatma (The Oversoul) are One. And what does Guru Granth Sahib ji start with? Ik (One). If 'One' is where it all starts off with, that means that you, me and everything around us, We're all the same. There is no difference. Sometimes we think that what's inside me is different than what's inside you and God is another thing, but that's just not possible. There is just One. There's no two. We started this talk with 'gur chela, chela guru', One is a devoted student of the master and the master is also a devoted student. 'vah vah gobind singh, aape guru chela', there is no difference between a Sikh and a Satguru that have become one. 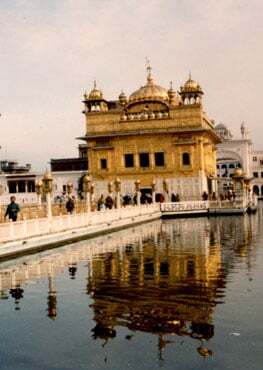 How does a Sikh merge with the Guru. It is written that Guru wants someone who is dead. What does this mean? A bodily death. It's written in Siri Guru Granth Sahib that no one has ever been liberated by simply dying a bodily death. People sometimes ask, "Can't I just give up this life, I'm so tired of all of this, can't I just meet God now?" But simply dying will not give liberation. So which death is Guru asking for? It can't be the death of the body. It also can't be the death of the soul, because the soul is immortal. It is the mind. Bhagat Kabir ji says that if you die the death of the mind you will never die again. Why? Because if you die the death of the mind, than you become Wahiguru and Wahiguru doesn't die. Kabir ji explains more that in order to have this death of the mind and the love for Wahiguru, you have to not love maya. If you love maya you can't be devoted. Our real identity is not our mind or our body, it is God that is inside of us. So why don't we see God or feel that ecstasy? When you look into water you can only see your reflection under two conditions. First, the water needs to be clean. Two, there can't be any movement in the water. These are the two things that we have the most difficult time with. Our mind is filled with the dirt of karma and it never stays put. If the mind was still and clean, then you would see Wahiguru. That's exactly what it is to become One with Wahiguru. You don't have to try very hard to meet Wahiguru, because you're already Wahiguru. You have to try hard not to be what you're not. That's a Sikh, the one who dies the death of lust, anger, greed, pride and attachment. Every time you think you are not connected to Wahiguru, just think that some old karma is coming to confront you, so right then and there do a prayer and trust that whatever obstacles are coming Guru can clear them. Do whatever it takes to connect with Wahiguru. Don't think you'll get to it later when you're older and wiser, do it right now. There are two ways. One is to fight with the mind, and that is great. The other is to go beyond the mind. To illustrate this second way here is a story of 2nd Guru, Bhai Lehna. Once Guru Nanak ordered those closest to him to go out and clean and dry his clothes. It was after midnight, dark and cold outside. Yet Guru Nanak said, "Go and clean the clothes, come back and dry them. It's the bright afternoon." 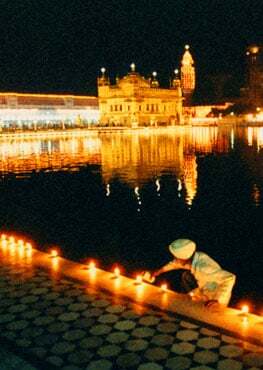 Other people told Guru Nanak, "The sun is not out, we can see the stars. It's dark and cold. When the sun comes up we will do it." When Guru gave this same order to Bhai Lehna, Bhai Lehna didn't trust his eyes which would have seen that it's too dark out to be afternoon. He didn't trust his skin that would have felt the cold outside. Without hesitation he put his hands together and said, "As you wish." He went to the river and washed the clothes, the sun came up. He dried the clothes. When he came back it was again dark and cold. Then Guru Nanak asked him, "Is it day or is it night?" To answer this question he went beyond his mind and said, "Guru ji, when you want it to be it is day. When you want it to be it is night. It is whatever you wish it to be." This brings up the question' "If you go beyond the mind, how will you function?" There is the way of the mind, and there is the way of the Guru. Manmat and Gurmat. This is what drove Bhai Lehna, "The Guru's Words are what drive my soul." That is what was surprising about Bhai Jagraj, a Sikh who listens to his Guru. Our prayer should be, "Oh King, please allow me to leave myself aside. Grant us the death of the mind. May I live by Your Words. This battle of life, may I win it in your form."